As the black swan queen and her performance, Natalie Portman has truly convinced the audience that she turned from the innocent character to a dangerous and powerful being. For the black swan costume, Nina wears a beautiful black ballerina outfit embroidered with crystals and black feather, black ballet shoes, black stockings, and a black crown. And with her perfect swan winged eyes makeup, Nina is nothing but the true black swan. To recreate this look, checkout our item list and tutorial down below. 1 Black Corset Top Get a plain black corset top, preferably embroidered with black feather. 2 Black Tutu Skirt Match up your top with a black ballet skirt. 3 Black Feather Belt Fasten a black feather belt to imitate the original look. 4 Black High Heels Match your outfit with a pair of plain black high heels. 5 Net Stockings Put on plain black net stockings. 6 Lace Gloves Wear black lace gloves to replicate the effect that is shown in the film. 7 Black Crown Select a beautiful black jeweled crown that you like to match the outfit. 9 Black Feather Pin Pin a black feather brooch on the left side chest of the corset. 9 SHANY Makeup Artists Eyeshadow Palette Use black and silver eyeshadow to recreate Nina's black swan eye makeup. You can check the tutorial down here! 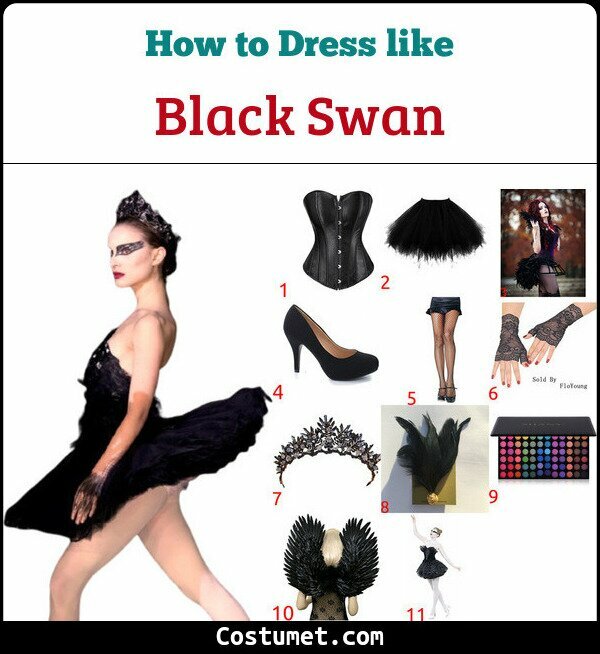 10 Full Costume If you have not time to assemble all these pieces of costume, you can check this full Black Swan costume to save your time. Nina Sayers is the main protagonist in Black Swan, a 2010 drama-psychological-thriller movie that explores the life of the perfectionist ballerina. In this critical-acclaimed film,Natalie Portman plays a suppressed ballerina who undergoes the dangerous and twisted path inside herself as she tries to achieve the perfection in the role of both white and black swan. As she pressures herself into perfecting the role of black swan queen, Nina experiences many strange things such as the hallucination and mood swing. By the end of the film, Nina actually believes that she's turned into the black swan queen. Black Swan had won Natalie Portman her Oscar for the best actress in 2011. This speaks a volume of how good she is in the film, to both the audience and the critics alike. Judy Hopps is country bumpkin but she’s shed her plaid shirts for something more challenging. She is mostly seen wearing her Zootopia police officer uniform.